Enigma Rooms is one of those companies poised between being a fully-fledged franchise and an independent operator. With four venues spread across Yorkshire and the East Midlands and clear branding shared between them, they’ve got many of the attributes of a chain but have thus far managed to retain the personal feel of the venues, and each game appears in only one location. Having played at one of their venues earlier in the year, we decided to visit their flagship and original location in Doncaster, where they had four games across a variety of genres. 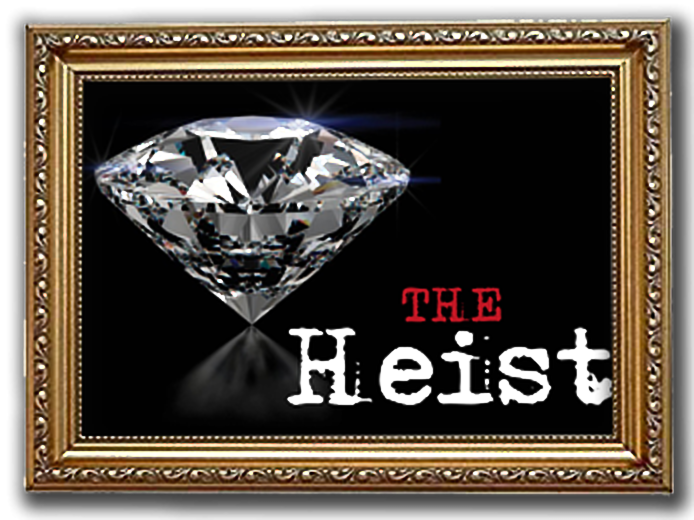 We’d opted for their newer games – the Heist and Mafia – to see where they’re heading. You’re a team of cat burglars with your eyes on the world famous Enigma Diamond. Will you escape with the diamond, escape with just your freedom or be caught in the act and do hard time? First impressions in the room were great, with it managing to create the sense of entering a small gallery complete with plenty of interesting artifacts to investigate. I particularly liked that the museum setting allowed them to have those intriguing items on show behind glass without complicating reset or risking significant damage from players. There were a lot, though, and I started worrying about whether the level of content might make it tricky to work out what was important and what wasn’t. Once we’d worked out where to start, however, that was not an issue at all – it was usually pretty obvious where to go next. Unfortunately, that first puzzle was, to my eyes, way too ambiguous. It opened up a matrix of possible solutions that made us frustrated with the game before we’d solved anything at all. In the end, it turned out we’d missed a key clue, but that level of ambiguity meant that, rather than think we were missing something, we ran through all the possible answers, double-checking that we’d gone through the complete range of choices. By the end of that run, we’d lost faith in the game, become frustrated and used up one of our three clues before we’d solved a single puzzle. As the game continued, there was a good sense of exploration through the museum in search of the Enigma Diamond that was the prize for this quest. The prettiness of the game continued and, while none of the other puzzles reached the level of ambiguity of the first, they still felt less robust than I’d expect given the rest of the room. This was their first foray into truly automated games, and it felt like perhaps this was where they’d focused their energies rather than on honing the puzzles. In general, that technology was designed to be hidden from players, but on a couple of occasions it became a bit more overt in a way that enthusiasts might find clichéd but I think will appeal to less experienced players (who are, after all, the majority of customers). The game ends, more or less, with a puzzle that brings together several strands to form a complicated but logical challenge. It’s the sort of puzzle where I can really imagine the whole team getting heavily involved although, with just two players, it instead involved a fair bit of toing and froing while the clock ticked rapidly downwards. That could be frustrating for some teams but, sensibly, they don’t end the experience there, instead completing the game with a final frantic race out the door combined with a simple puzzle to ensure you leave on a high. We escaped with very little time left on the clock, having officially taken two clues although having been nudged on four occasions. This game looked pretty, but a weak start held us back and meant we were frustrated before things really got going. If you can focus on the beauty, are able to let that weak first puzzle wash over you, and have a bias towards games with no padlocks, then I think you’ll enjoy the experience. Otherwise, I think you’d be better off playing the other game we visited at the venue, Mafia. It’s a linear game with relatively few puzzles. This would generally make it perfect for two people, but I think the nature of those challenges means that having three or four would be fine. Several of the puzzles have multiple elements so, in spite of the linearity, don’t expect to find yourself as a spectator in larger groups.